Importing from China to the United States takes many entities working in sync to keep the supply chain moving. There are a few basic guidelines when importing from China. Sourcing goods, paying for goods, arranging shipping and final delivery and more are all parts of the process. U.S. Customs guidelines for importing products from China. Understanding the basic concepts associated with importing from China can help make the import process hassle-free. Start importing from China by following the guidelines below. Sourcing and Importing from China: M.A.P.S. Who Pays for What and What is My Responsibility? Do I Need a Permit to Import from China? How Do I Get My Freight Moving? What are My Responsibilities to the U.S. Government? Do I Need a Customs Bond When Importing from China? How do I receive my goods to my place of Business? Ready to get Started Importing from China? When you’re thinking about sourcing products to sell from China, there are a few questions you might ask yourself. Are my Imports from China marketable and easy to sell? Do my imports from China have profitable margins? Do my imports from China have or bring quality to the market? Are my suppliers easy to work and communicate with? Answering these questions can help you source goods. There’s a simple formula to follow when you seek to find products to import from China, MAPS. MAPS is an acronym standing for Marketable, Affordable, Profitable and Sellable. When you find suppliers, keep MAPS in mind. What makes my import from China unique? What are the product’s benefits and economical properties? Does my import from China have sustainability? What does it cost in to produce in the U.S.? Does a specific supplier specialize in “like” products? What are my landed cost per unit? What does my import from China sell for in the U.S? 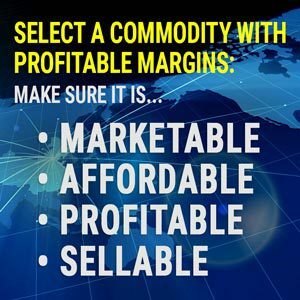 What is the profit margin per unit? What demographic am I pursuing? Where will my Imports from China sell best? Why will my import product be successful? Are my imports from China competitive? Many importers travel to China to meet with Chinese suppliers. Many regions in China specialize in the manufacturing and wholesale of specific goods. Items like furniture from China and toys imported from China have their own markets. If you are unable to travel to China to meet with suppliers, you might want to work with a sourcing agent. A sourcing agent from a trade company will work on your behalf to reach out to suppliers and Chinese factories that manufacture the goods you seek to import. Online global sourcing is also a growing market for those importing from China. Websites like Alibaba.com make it simple to order goods from Chinese suppliers. You might need to be aware of minimum order quantities (MOQ) when importing from China. Some wholesalers and manufacturers have a low MOQ for small orders, others have a high MOQ for larger orders. Another thing to be aware of when participating in international trade are Incoterms. Incoterms are established commercial regulations that were created by the International Chamber of Commerce (ICC). Incoterms relate to international commercial laws. Incoterms are used in many commercial transactions and the procurement process. Trade councils and international courts both encourage the use of incoterms to make the import process seamless and easy. Incoterm regulations are designed to communicate the tasks, expenses and risks associated with importing goods and global trade. There are 11 established Incoterms you’ll likely need to know when importing from China. Ex Works (EXW). According to the ICC, EXW refers to when the sellers delivers the goods to the importer’s premises. The buyer loads, clears goods for expert and covers any clearances. Free Carrier (FCA). The ICC states that free carrier means the seller delivers the products to the carrier to the named place of delivery. Carriage Paid To (CPT). This term means that the supplier delivers the imported products to the buyer’s carrier or to a different agreed upon place, like a warehouse. With this rule, the seller must pay for the cost to bring the goods to the agreed upon place. CIP Carriage And Insurance Paid To (CIP). According to the ICC, this term refers to the seller deliversing the imported products to the buyer’s carrier or to another agreed upon place (warehouse, etc.). With this rule, the seller must pay for the cost to bring the goods to the agreed upon place. Additionally, the seller contracts for insurance for minimum coverage. If the buyer wishes to have more coverage, they are responsible. Delivered at Terminal (DAT). This term means that goods, once unloaded at the port of arrival or terminal, are at the disposal of the buyer. In this case, the seller bears the risk involved in bringing and unloading the goods at the destination. Delivered at Place (DAP). The ICC states that this term means the seller has delivered goods to the buyer’s place of disposal and goods are ready to unloading at the agreed upon destination. The seller takes on all the risks involved in ensuring the goods make it to the agreed upon place. Delivered Duty Paid (DDP). This term means the seller delivers goods and clears them for import. The seller takes on all risks and costs associated with bringing all the goods to the agreed upon destination. The seller also pays duty for export and import and oversees customs formalities. Free Alongside Ship (FAS). According to the ICC, FAS means the seller delivers when the goods are alongside the vessel of transport, like on a barge or quay, selected by the buyer at the agreed upon port of entry. In this case, the risk of damage changes when the goods move from the ship to alongside. The buyer assumes all costs from the time the goods are removed from the ship to alongside. Free on Board (FOB). This term refers to the seller delivering foods on board the craft selected by the buyer at the named port of entry. The risk of damage changes when the goods are loaded onto the craft or vessel and the buyer assumes all costs from then onward. Cost and Freight (CFR). In this case, the seller is responsible for goods until either on board the vessel or already delivered. Risk of damage or loss stops when the goods are on the vessel and the seller must contract and pay the cost and freight to bring the goods to the port of entry. Cost, Insurance and Freight (CIF). According to the ICC, this term refers to the contracting of insurance to cover the buyer’s risk and loss of the goods during transport. Under CIF, the seller is only required to obtain minimum insurance coverage. Any additional coverage is the buyer’s responsibility. Following established Incoterms from the outset will clearly outline the sourcing responsibilities between you and your supplier. Incoterms define financial clarity, reduce and remove doubt of what your exact contractual supply chain responsibilities are in the sales process. 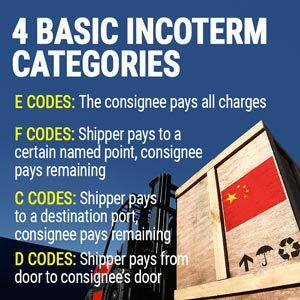 Learn more about Incoterms from the ICC. Transportation costs. It’s up to either you or the seller (depending on Incoterms used) to move goods from China to the U.S. Transportation by air, sea, rail or truck can add when when importing from China. Warehouse, Inspection and Port of Entry Fees. Products imported from China are open to inspection when crossing U.S. borders. In some cases, these inspections can cost you. Depending on the products imported, these fees can add up to unexpected costs. Additionally, you might owe port fees at the time of inspection. Customs Broker Fees. Working with a Licensed Customs Broker can help make the import process easy. They can help ensure all fees are paid, permits are obtained and help get your goods cleared for import. There are fees associated with working with a licensed customs broker. Agent Fees. When importing from China, customs agents can inspect your goods. This can sometimes result in fees. You can pay these fees at the port of arrival to help get your goods into your warehouse or location. There is no general import permit for importing products from China. However, you might need a permit to import from a federal agency certain goods from China. Different federal agencies oversee different imported products and requirements can vary. As an importer, you must ensure your imported products meet all federal requirements, which sometimes include permits. Food and Drug Administration (FDA). The FDA oversees the import of all food, medication, cosmetics, some housewares and food-related items, health devices, and more. The FDA requires prior notice be given for all imported food products. Environmental Protection Agency (EPA). Chemicals imported into the U.S. are often regulated by the EPA. Department of Transportation (DOT). According to information from CBP, imports regulated by the DOT include cars and motor vehicles. Consumer Product Safety Commission (CPSC). Toys and children’s products are among imports regulated by the CPSC. Federal Trade Commission (FTC). The FTC oversees a variety of parts of the import process, including product labeling and more. U.S Department of Agriculture (USDA). The USDA oversees the import of plants, plant-products, wood, animals and more. In many cases, the USDA requires permits and more. Alcohol and Tobacco Trade and Tax Bureau (TTB). The TTB issues permits for importers of alcohol and tobacco products. TTB permits include the Federal Basic Permit, Certification of Label Approval (COLA), Natural Wine Certificate, and Certification of Age and Origin. These permits are required when importing alcohol. You’ll find that importing goods from China isn’t like working with a domestic supplier. You often can’t swipe a credit card for payment, so you’ll need to find other ways to pay. Generally Chinese suppliers prefer methods of payment that involve working with a bank. International wire transfer. This is a fairly common method payment for small- to medium-sized transactions. In many cases, international wire transfers are made before the delivery of goods. Open account. This method of payment allows the importer to pay for goods after they have been received. The wholesaler or manufacturer extends credit. Letter of credit. This method of payment works like a traditional bank loan in many cases. To use this payment method, the buyer’s bank provides a letter stating how much credit is available to the buyer. A letter of credit often functions as a conditional bank guarantee. The buyer’s bank will pay the supplier when the obligations of the letter are met. The buyer will then make payments to the bank to satisfy the line of credit. Online escrow. This payment method works like a letter of credit and is commonly used for smaller transactions, including those less than $5,000. You might find that online importers tend to prefer this method of payment. Documentary collection. This works similarly to a cash on delivery (COD) option. In the case of documentary collection, the seller’s bank will work with the buyer’s bank for the collection of payment. Imported products can be available before or after payment, depending on the method of documentary collection used. The method of payment you select likely depends on many factors.The seller’s preferred method of payment and the risks and benefits associated with each method might influence your decision. After you pay for your imports, it’s time to arance shipping. Shipping costs can vary. Many imports from China are shipped via sea freight. Shipping goods doesn’t have to be a complicated process. 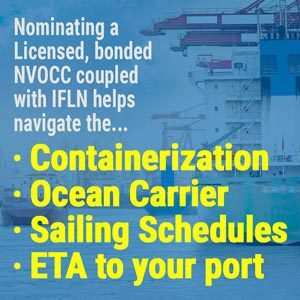 Nominating a licensed, bonded Non-vessel Operating Common Carrier (NVOCC) coupled with International Freight and Logistics Network (IFLN) agency at the point of origin will help navigate the containerization, ocean carrier, sailing schedules and estimated time of arrival to your destination port of entry. There are many things to be aware of when importing from China. When shipping goods from China, you’ll need to think about container fees, product packaging, terminals and handling, customs bonds, and broker fees. Nominations. When importing from China, nominations refer to when the carrier is chosen by the buyer. In this case, the terms of delivery are on an EXW basis according to Incoterms. The buyer nominates a carrier or shipper to deliver goods from the supplier’s factory or warehouse. The buyer arranges how to get the imported goods to the final destination. Containerization. When importing products from China, containerization refers to the process of shipping goods in large containers in bulk. Ocean carriers. Ocean carriers are the shippers you may nominate to move goods from China to the U.S. There are hundreds of carriers, each serving different terminals and ports of entry. Port terminals. Sometimes also called a container terminal, port terminals are facilities where ocean carriers deliver cargo containers. From there, containers can be shipped by rail or truck to the final destination. Dock receipt. This term refers to a receipt issued by the ocean carrier to document that a shipment has been received at the carrier’s warehouse or dock facility. Freight forwarder. This term refers to the agent responsible for moving cargo to an overseas destination. When importing goods, a freight forwarder can ensure your imported goods make it to the ocean carrier on time. You might want to ship your imports from China in bulk to save on shipping. Items shipped in bulk from China are often transported in 20-by-40 foot containers. A full cargo container holds approximately 2,400 cubic feet or 800 square feet of goods. A full cargo container can haul 61,000 pounds of goods. If you plan to ship in bulk from China, you might want to consider either full cargo load (FCL) or loose cargo load (LCL) shipping. If your imports from China are at least 5 pallets, FCL shipping might be the best option. If your cargo is a lesser volume, LCL shipping might better accommodate your needs. When shipping imports via LCL, they will share cargo space with other, similar goods. Shipping from China can take some time. Transit time might take between two weeks and two months. Customs clearance can add to this time. You might estimate that goods shipped in bulk from China will arrive in 2 or 3 months, depending on circumstance. You might use air freight rather than sea freight if you are shipping small amounts from China. Air freight is more expensive than sea freight, but also much quicker. Working with a Licensed Customs Broker can help you figure out the best shipping method for you. Clear Description of goods dictates Duties and Taxes levied against the imports’ commercial value. The Harmonized Tariff Schedule (HTS) lists numbers to determine the duty percentage based on U.S. manufactured goods to insure a level playing field in the business sectors. A receipt or a bill of lading listing the items to be imported. An official invoice that lists the country of origin purchase price, and tariff classification of the goods imported. A packing list that details the imported goods. An arrival notice authorized by a U.S. Customs Agent. A customs bond can help make the import process easier. In many cases, a customs bond is mandatory when importing from China. 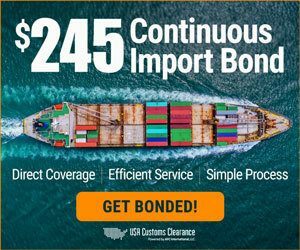 CBP mandates that you use a customs bond when your imports are valued at more than $2,500 or the imports are subject to another federal agency’s oversight. A customs bond is basically an insurance policy covering the payment of duties and taxes to the U.S. government when you are importing goods. A customs bond will ensure that duties and taxes are paid even in extraordinary circumstances. Imports arriving by air and sea will need a customs bond. You might find that you will be subject to delays and fines if you do not have the correct customs bond when importing from China. If you elect to work with a Licensed Customs Broker when importing from China, you might be able to use the broker’s bond to secure your transaction. It’s important to know there are 2 kinds of customs bonds you can choose from when importing from China: Single entry bonds and continuous bonds. The bond type you choose will likely depend on how often you plan to import goods from China into the U.S. The difference between the bond types is simple. Basically, a continuous bond will cover all the shipments you import during a one year period. A single entry customs bond will only cover a single shipment of imported goods into the U.S. Continuous bonds are considered simpler than single entry bonds. To get a continuous entry customs bond, you will pay for at least $50,00 in coverage. It is often more economical to purchase a continuous bond if you plant to import multiple shipments during a calendar year. A continuous bond also covers the Importer Security Filings (ISF) requirements you might be subject to, so no additional bond is required. Prices for continuous bonds can vary. The first step in the process for securing your continuous bond is to visit our continuous customs bond page. You can do this online easily through USA Customs Clearance. Single entry customs bonds can a little more be complicated that buying a continuous bond. The minimum amount of the single entry bond you purchase is required to be worth at least the value of the goods, plus the taxes, duties and fees you will owe on them. Additionally, if the goods you are importing are subject to oversight from another federal agency, the bond must be worth at least three times the value of the goods imported. For example, if you are importing $7,000 worth of electronic goods that are subject to regulations from the Federal Communications Commission (FCC), you will be required purchase a bond worth at least $21,000 to fulfill this obligation. You also might find that the cost of a single entry bond can vary by surety company you chose to work with. Additionally, you are required to have have supplementary bond coverage to meet ISF mandates if you are shipping your imports from China by sea. If you are working with a Licensed Customs Broker, you might be able to use their bond to cover your transaction. This is often included in the cost of doing businesses. Ask your Licensed Customs Broker for details. 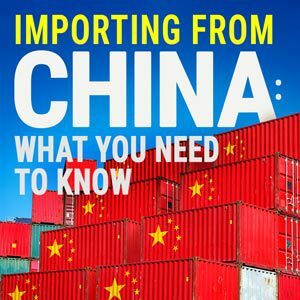 If you are handling the import of products from China, you may obtain the customs bond you need through a company licensed by the U.S. Department of the Treasury. If you are purchasing a bond on your own, you should keep in mind that you are buying an insurance policy for the taxes and duties on your imported goods. Costs will vary. You can request a quote from USA Customs Clearance to obtain a customs bond today. Your Licensed Customs Broker can be a great asset to you when you are importing from China. Your Licensed Customs Broker will make sure that your imported goods effectively cross borders and arrive at the port of entry in a timely matter. Your Licensed Customs Broker can help you ensure that your shipment of imported goods follows all customs regulations and rules when entering the country. Your Licensed Customs Broker will work with you hand-in-hand to make sure the import process goes smoothly and efficiently. Arrange customs clearance for imported goods at the port of entry. Prepare for the release of goods imported from China. Make sure that products and goods imported enter the country efficiently. Work with CBP to ensure that all government duties, taxes and fees are paid as needed. Determine which permits are required to import your goods and help you with obtaining the needed permits. Advise you through the import process, including determining entry options for your goods, navigating free-trade agreements, and tax or duty deferment. Your Licensed Customs Broker works on your side. Your Licensed Customs Broker will put their expertise and knowledge to work for to make importing from China a simple and easy process. Learn more about working with a Licensed Customs Broker from AFC International. After the goods have cleared clearance and have been released by CBP, a Draymen with an Terminal Worker Identification Card (TWIC) and an Interchange agreement with the ocean carrier will set an appointment to schedule a pick up and deliver your imported goods to your place of business. Your imports might be shipped on a train to a location closer to you. Then your imported goods might be shipped on a truck to your warehouse or retail location. Can these goods be legally imported? Some imports from China have special rules around them. Your Licensed Customs Broker can help you determine if your products are legal for import. Will you be responsible for shipping costs? Depending on the Incoterms followed, you or the seller might be responsible for shipping costs and the assumed risks. Be sure to work with the seller to determine the Incoterms followed to make the most of your transaction. Shipping options might include ocean freight, air freight, international postal service or courier service, depending on the product imported and the size of your order. Is the product information informative and clear? Make sure you have all the details on your imported goods. Providing inaccurate information about the goods and their value to CBP is illegal. Make sure you have correct and accurate information about your imported goods. Are you following proper customs procedures? Your licensed customs broker can help ensure all customs procedures are met and all regulations are satisfied. Do I need product liability insurance? Product liability insurance can cover you from losses coming from defects in products. If you are importing products from China, you might want to discuss product liability insurance with an insurance professional. Do I have the right customs bond? There are two options for customs bonds. Make sure you’ve selected the right bond for your business. A continuous bond can make the import process simple. You Licensed Customs Broker can help ensure you get the proper customs bond. Importing from China can be a lucrative, exciting and, at times, challenging endeavor. Allow USA Customs Clearance to help manage challenging times while you enjoy the lucrative ones. Working with a customs specialist from USA Customs can help ensure that you have all the proper documents in place to make importing from China seamless and easy. Open the chat box in the bottom right corner and you’ll instantly be in touch with a customs specialist who can get you the information you need right now. Hi Mike, thanks for posting your question. You can speak to one of our customs brokers right away by clicking on the chat button in the bottom right corner of the page. They will be able to help get you the customs bond that you’ll need. I have the same question. can you write me if you have learned the answer yet? One of our customs brokers will be in touch soon, or you can click on the chat button at the bottom right corner of the page to speak to someone right away. I do like that you said that there are Chinese suppliers that specialize in manufacturing items in bulk to make sure that you’ll be able to purchase in wholesales. My husband and I wanted to own a furniture store in the future. What we want is to reduce our capital cost in sourcing our products without cutting the number of items that we need, so we’ll make sure to consider China sourcing. Thanks for your comment! When you’re ready to start importing, we’re here to help you through the process. You can speak to one of our customs brokers right away by clicking on our chat button in the bottom right corner of the page. hi! this is a excellent site and i always enjoy the data posted below. Bookmarked and shared. Thanks once again! I have 5000 bottles of supplements in China. Can you make a good price to bring and do customs clearance of it? Your info has been submitted to our import specialists who can help you with importing your supplements into the US. You can expect an email from us soon. I’m thinking of importing steel pipe end caps from China. This is our first time to import from China. I’m not sure of the process. It would be an approximate $1500 purchase. If your import is for commcercial use and you plan on importing more than once in the year, a continuous bond would be the way to go. You can easily purchase your bond though our site or chat with one of our import specialists by clicking the box in the bottom right corner of the page if you have more questions. We also offer consulting where one of our customs brokers can walk you through the whole process and answer any questions you may have. We are here to help!